We are all anxiously awaiting Brotherhood and with the constant information coming from Ubisoft as we get closer to release is not helping much. 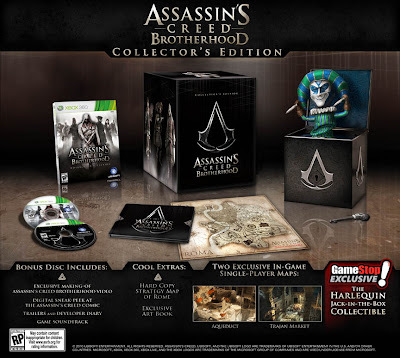 In their most recent email blast, they reveal the contents of the collector's edition and it looks like they did not pull any stops as this is the best looking CE I have seen in a while. The box will set you back $99.99, but a creepy jack-in-the-box has got to be worth most of that right?